Previous blogs have looked mostly at majority nationalist districts, but these are not the only ones that are of interest, of course. There are other categories; districts that are overwhelmingly nationalist or unionist, and for which no change is likely, and districts that have retained a majority from one or other block throughout the period, but for which there are stirrings in the undergrowth. Today's case is one of the latter: Craigavon Borough Council. Lying at the heart of Northern Ireland just south of Lough Neagh, it contains the towns of Lurgan and Portadown, the latter world famous as the scene of some of the worst community confrontations in recent years, particularly the contentious attempts by the Orange Order to march down Garvaghy Road. The area also saw some of the worst and most bitter sectarian murders of the troubles, and was home to some of the most unpleasant of unionism's supporters. As a result, it is widely seen as a unionist bulwark. However, as we shall see, even in unionism's back garden some green shoots are budding. The unionist percentage of the vote did not change significantly during the period, which implies that the period saw a consolidation of the vote into the two communities, and a decline in the unaligned vote – both the Workers Party and the Alliance Party did less well in Craigavon in 2005 than in 1985. Nonetheless, the gain over the period has been by nationalism which ended in 2005 with 10.6% more of the vote than in 1985, whilst unionism ended with 3.9% less than in 1985. At the end of the period, in 2005, nationalism was receiving the support of 6.4% more of the electorate than in 1985 (24.1% against 17.7%). Unionism, however, despite its boost in 2001 ended the generation with a lower proportion of the electorate: 35.5%, down from 38.1% in 1985. The gap between the two blocks, in terms of percentages of the electorate, had narrowed by 9%. In terms of the votes actually received, the gap had narrowed by almost 15% (from 33.1% to 18.6%). The graph shows that while around 80% of Craigavon's old people are Protestant, this proportion reduces with age, eventually reaching approximate parity at some ages between 20 and 40. Below the age of 20, however, Catholics begin to outnumber Protestants. As the two ends of the electorate are so different (the exit end is 80% Protestant, the entry end is around 45% Protestant), continued change is inevitable. Even if the left-hand side of the graph continues in its apparent flat state, the long-term outcome for Craigavon is approximate equality between the two blocks, or a slight Catholic (and therefore perhaps nationalist) majority. The sharp increase in the proportion with no religion, or none stated, at very low ages is interesting. The children themselves clearly did not make that decision, so their parents, who declared a religion for themselves, declared none for their children. Perhaps they represent an increase in mixed marriages, in which the children are not designated as either Catholic or Protestant. The next census may throw more light on them. For the time being, Protestants (and thus unionists) have a numerical advantage in the district. The electorate in 2001 was 56.2% Protestant, and 42.1% Catholic. This matches the outcome of the 2001 local elections quite closely: 56.1% unionist, and 41.4% nationalist. However, by the next local elections (2011) many of the older voters will have died, and those who were teenagers in 2001 will be voters. Thus the gap between the two blocks should shrink some more. Approximately 2500 older voters will have died (75% of whom will be Protestant), and around 13000 new voters will have reached 18 (52% of whom will be Catholic). Not all of these new voters will stay in the district, so the potential gain to nationalism will not be so great, but unless migration is severely unbalanced, the net gain to nationalism should be much greater than the net gain to unionism. It must be stressed that not all members of a religious block will vote for its corresponding political block, but experience shows that the overwhelming majority do. 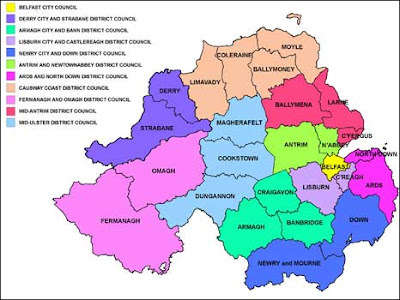 In 2011 Craigavon Borough will form part of the new Armagh City and Bann District Council, along with the current Armagh and Banbridge districts. The new district will have a unionist majority, but one that is gradually reducing. The precise balance and evolution will be examined in a later blog. Great work. As a reader I'm very grateful but I worry that you can't be getting any rest. What's your take on the Upper Bann Westminster seat? Is it a possible gain for nationalism in the mean/long term? On Upper Bann, I will have to look at it - it's been a while since I last gave it much thought. Check back here in a day or two! As for rest ... lol, this IS relaxation for me! Fifty per cent plus one? And this is what they’re afraid of? Policing and Justice finishing line approaching?